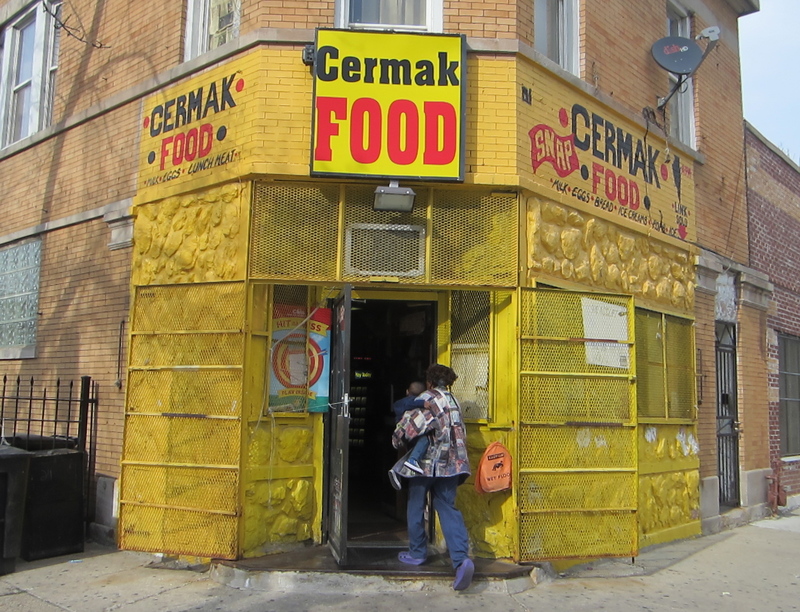 Cermak Road is the waistline of our hourglass-shaped metropolis. Running 6.2 miles from the border with west-suburban Cicero to the road’s eastern terminus at King Drive, it’s just about the shortest way to get across Chicago. The road, which passes through several formerly Czech enclaves, was named in memory of Anton Cermak, a Czech immigrant who served as mayor from 1931 to 1933. On February 15, 1933, Cermak was shaking hands with Franklin Roosevelt in Miami when he was fatally shot by an assassin gunning for the president. I’ve walked the length of a dozen or so Chicago streets in search of adventure, but I got the idea to stroll Cermak Road from writer and musician Rob Reid, who led a group excursion on the road last Saturday to mark the martyred mayor’s 141st birthday. Since I couldn’t attend, I made a solo attempt the previous Wednesday. Around 4pm, I depart the Pink Line’s Cicero-Cermak station in the suburb of Cicero. The town’s Cermak retail strip is dense with Mexican-American shops and restaurants. Once the home base for Al Capone, Cicero made crime headlines again in the aughts, when town president Betty Loren-Maltese was caught misappropriating $12 million. Walking east, I spy a castle-like tower that’s the last remaining structure of Western Electric’s Hawthorne Works plant, which once employed over 40,000 workers. Peckish, I duck into Scatchell’s Beef, an old-school snack stand, for a Chicago-style corn-roll tamale. A counterman scoops Italian ice in lurid primary colors. After crossing under some train tracks two blocks east of Cicero Avenue, I’m in the K-Town section of Chicago’s Lawndale community, so called because the north-south streets have names like Kostner, Keeler and Karlov. Lawndale was once home to Martin Luther King Jr., who rented an apartment at 1550 South Hamlin while campaigning for fair housing in 1966. I pass by blocks of redbrick two-flats, where teens are hanging out on porches and stoops, some reciting raps, and old men converse in chairs on the sidewalk. I come across the imposing Greater St. Paul A.M.E. Church, 4236 West, with a memorial to Czech priest and philosopher John Hus carved in stone near the roof. I make a note to send a photo to his namesake, the leader of the John Huss Moderate Combo, a rock band I played bass for in the nineties. At Avers Avenue, there’s a charming community garden with mini murals illustrating words like “faith,” “joy,” “patience” and “peace,” plus encouraging slogans like, “Be the change you want to see in the world.” Soon afterwards, I get an encouraging comment on my tweed flat cap. “Like the hat, man,” says a middle-aged guy on a stoop. “Nice shopping.” He’s wearing a sharp fedora himself. “Thanks, you too,” I reply. Around 3400 West, Cermak jogs north to go under Metra’s BNSF Line to Aurora, and when I emerge on the other side, I’m suddenly in bustling Little Village. I stop by I Love Tamales restaurant, 3218 West, and pick up a bag of handmade chili and cheese tamales, a completely different animal than the mechanically extruded ones from Scatchell’s, but equally tasty. Marshall Boulevard, about 2900 West, features broad expanses of parkway that abut the houses. Just east is the vintage Apollo’s 2000 theater. Oddly, its large, vertical sign is attached to the ornate façade with an I-beam that goes right through the face of a carved angel. 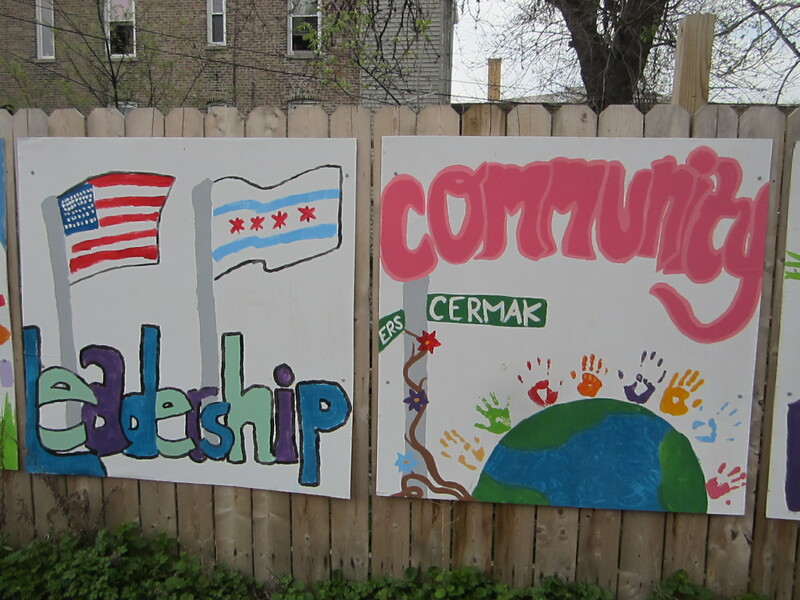 East of Western Avenue is the Heart of Chicago neighborhood. A bit south on Hoyne, I see the handsome twin steeples of St. Paul Roman Catholic Church, built by German immigrants in the 1870s. At Damen, Barrett Park is a pleasant green space featuring mural images of liberation icons like Cesar Chavez, Mahatma Gandhi and Malcolm X. After Ashland Avenue, I’m in Pilsen, named after the Czech city that’s the birthplace of Pilsner beer. In 2012, the city dubbed Cermak and Blue Island Avenue in this area “The Greenest Street[s] in America,” after installing sustainable features like bioswales, smog absorbing bike lanes and wind-and-solar-power streetlights. A few blocks east is the former Fisk coal-fired power plant, which closed two years ago after contributing to poor air quality and high asthma rates in the neighborhood for many years. I pause to enjoy a breathtaking view of the river and skyline from the bridge, then make my way into Chinatown. As part of the recently announced Wentworth-Wells Connector project, the city will realign the off-kilter intersection of Cermak and Wentworth. That will make it a lot easier to walk from the Cermak/Chinatown Red Line stop to the old-school business strip on Wentworth. The sun is sinking as I stroll past Bertrand Goldberg’s cylindrical Hilliard Towers apartments. Just east are the Green Line elevated tracks, where the city is building a new Cermak stop this year. The $50 million station has an attractive design, but it seems pretty redundant, since it’s only about one block east of the Red Line. A few blocks later I reach the end of the road at the King Drive intersection. However, it’s still possible to travel the extra few blocks to the lake. Just south of the intersection, I enter the massive McCormick Place convention center, make my way up to the second floor and walk to the east end of the building. From there, a long outdoor plaza takes me over Lake Shore Drive, and stairs lead to a lakeside memorial park for fallen firefighters. Sitting at the water’s edge, I’m right in front of the southern tip of Northerly Island, currently being rebuilt to include a campground for at-risk youth. In the twilight, I gaze at the skyline and a passing sailboat, and listen to the cries of gulls. Another successful walk is complete.